We cover the implications of the Menulog data breach on your restaurant. We look at a great way for you to work on creating a Restaurant Marketing Strategy Plan. If you are opening a Restaurant, you only get one shot at opening night. If it isn’t a success, then you are stuck behind the eight-ball trying to build momentum for your Restaurant. It can be hard to get past people’s impression of your Restaurant being the one that is always quiet because the locals don’t go there. Cash flow is a big thing too for new Restaurants, the sooner you start getting customers, the sooner you will have start getting some cash flow and return on your massive investment in time and money. We look at the importance of your Marketing Budget, and how to get great logos cheaply. We spend some time getting you to understand what it is that makes your Restaurant unique. This is important as it can make or break your Restaurant. We talk about how important it is to hire well before you open. Getting the menu right is really important. We look at some of the factors that can make a huge difference in your Restaurants success. The menu is really critical, so make sure you spend enough time before you open on getting it right. Facebook and Instagram can make a huge difference too both pre opening and on opening night, so follow our ideas on how to make the most out of these killer social media tools. Think too about the importance of your domain name. Getting this one right can make a huge difference in your Restaurants profitability. James Eling: Hey, it’s James from Marketing4Restaurants and welcome to episode 20 of Secret Sauce, the restaurant marketing podcast. 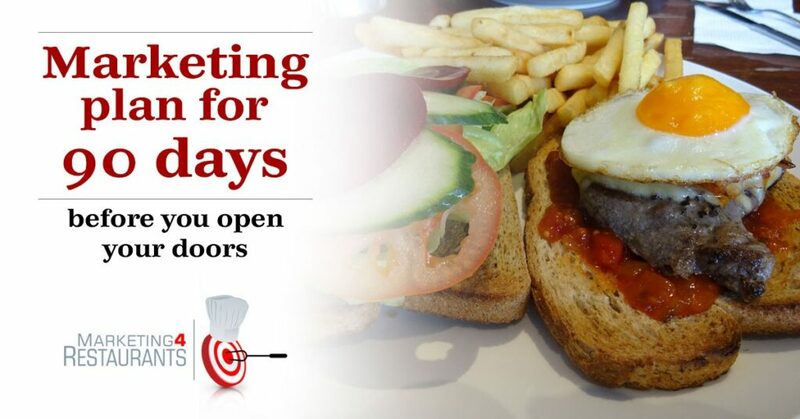 Your 90-day restaurant marketing plan before you open your new restaurant. James: Hey, welcome back everyone. How did you get on with the pizza marketing episode? Doesn’t Bruce have a wealth of information about how to market pizza restaurants? And a lot of it applies for restaurants in general. Particularly interested in his comments about Snapchat, I think that’s a really interesting space and it’s going to be very interesting to see what happens with Snapchat over the next 12 months. So, the big news, in Australia at least, this week was the fact that Menulog has had a breach of part of their database and 1.1 million email addresses have been leaked out. And there was one thing that I thought was really interesting about it was that they put out a press release on their blog to state that they took the privacy of their customers very seriously. There was no real mention of the impact that it was going to have on restaurants. So, what happened was people, restaurant owners were able to log in and see, and there’s a screenshot of it, of 1.1 million customer details. Now, the big thing, and I think that it highlights the philosophical difference with Menu Log. They view their customers as the people who order food, and they view the restaurants as their partners who provide a service delivery. They’re actually trying to break the nexus between the customer and the restaurant. So, a lot of restaurants think that they have their customers who order from them using Menulog. Menulog is trying to build if their customers who order food from them and then they get restaurants to provide that, and it makes it really difficult. And you can see that this is the way that they want to operate, because they don’t provide the email addresses to the restaurants. Now, if they were actually helping the restaurant, providing a service to them, then they would provide the email address because the email address is the fundamental part, it’s the biggest part of your, it’s one of the biggest parts of your marketing plan would be to build your email address list. And we’ve talked about that many times, about how to do that. So, in their press release there was no mention of the impact it was going to have on restaurants. So, effectively, what could happen is a restaurant could have gone into that database, downloaded the 1.1 million email addresses, worked out who was in their local area and started emailing out to those customers. Very unfortunate. And so, we’ve written a blog article on the things that restaurant owners should do, just to be able to keep track of who is emailing out to them. I think that’s really important. And, of course, if you are looking to take online orders then you should be using a system that doesn’t charge you, and provides you with the email addresses. And it’s interesting, before this happened, this happened at the end of March, for us at Marketing4Restaurants, our free restaurant online ordering system was up 30 percent month on month. That’s after adjusting for February only having 28 days. So, very exciting and I think it’s because more restaurants are getting on board and their customers are getting increasingly used to ordering directly from the restaurant, and I know some of the restaurants have got all sorts of interesting deals pushing this, “Order direct from the restaurant and save.” That way, they can control the customer, the communication that goes out to the customer, they know how frequently they’re ordering from them, and it’s not being handled by a third party that’s trying to restrict some of their information. Another really exciting development with the Marketing for Restaurants team is that we’ve had a lot of restaurants who’ve reached out to us and have wanted to work one on one with us. We haven’t really had a product that we’ve been able to help people with up until now. What we’ve done is we’ve listened to all of the concerns that people have got about their restaurant marketing and we’ve created the restaurant marketing strategy plan. I think it’s a really exciting way that we can help restaurant owners to move forward with their marketing. It combines the four important parts of marketing. So, we look at the current marketing that you do and we come up with a strategy for your restaurant. We then come up with a plan that has targetable actions that we can carry out. We then do execution. So, we’ll actually go through some of those actions that we’ve come up with in the plan, and then we go through monitoring. So, we’ll go through and we’ll actually monitor the effectiveness of that marketing. Because, you know, some of the marketing’s going to work, some of it doesn’t, it’s important to know which is which. On all of those things though, what we then do is we train and mentor you. So, while we do something, we’ll then hand you a document showing you how we actually did that, which is something that you can hand to your team to show them how to do the marketing. So, this is really about training you and mentoring you around doing and conducting your own marketing. And we top it off with, one month after the whole program finishes, we will go through and come back with you and sort of close the loops, find out how the marketing that you’ve been doing’s going, critique it, help you to improve it, and then ask any further questions that you’ve got. So, it’s perfect for any restaurant that’s wanting to spice up their existing marketing, or for someone who’s about to open a restaurant now. And that’s a perfect segue into today’s podcast topic, which is your 90-day marketing plan before you open a restaurant. Now, this is assuming that you’ve already got your business plan sorted. And I know it’s very scary because a lot of people don’t have a strong business plan, or any business plan whatsoever. It’s also assuming that you’ve gone and done your marketing plan, and I know equally as scary. There’s a lot of people out there who haven’t done their marketing plan. And I think everyone needs to have a good hard look at where it is that they are in their business. Because the restaurant industry is one of the hardest industries in the world. The hours that you face are, for most people who are running a restaurant, are incredibly long. And the chances of success sadly are not that great. There’s so many restaurants that come and go because people haven’t been well and truly prepared. Now, we’re talking about the 90-day restaurant marketing plan because really you are just three months out from opening day, and it’s like having a baby. Because you’re going to have a lot of sleepless night, and there’s going to be crap everywhere, alright. For those of you who’ve been parents, you know that the fundamental difference, once the restaurant opens, the demands on your time are going to be huge. So, you are 90 days out, you need to really hustle now to get everything in place. Because I find that it’ll often take 12 months to get their routine sorted and to be able to try and get under control with the kind of things that they need to be doing in their restaurant. So, you’ve got 90 days until it opens to get everything sorted that needs to be sorted. And I think that’s really scary. So, the kind of things that you want to start thinking about. You may or may not have your logo, your graphics design, you know. You can use someone like 99designs to do that. The Marketing for Restaurants logo, that’s where that came from, 99designs. I think it’s great, particularly if you don’t have anything strong in mind. The great thing about 99designs is that you get all sorts of interesting ideas that people will send out to you, and I think that that, you know, the great thing about 99designs is that you’ll get lots of different designs that you can look at. And particularly if you haven’t got a strong idea about what it is that you’re after. Now, budget, where are you at with your budget? Budget’s a really big thing, and I think that your budget needs to have been done properly. Far too many times I’ve seen, and I’ve seen restaurants that have closed because in the 90 days prior to opening, they spent too long. Or, the 90 days that they thought they had actually turned into 180 days, so someone’s quit their job, they’re getting the fit out done, then they’re waiting for council permits, or fit out to be done, or something else holds things up and they’re trying to live off the money that they’ve saved and the money that they’ve budgeted for an extra 90 days. So, you need to have a think about your budget. One of the biggest mistakes that I see people doing is that they spend a lot of money prior to the opening, then they don’t have any money leftover for a marketing budget. And then you’re stuck with this new restaurant, not a lot of customers, and no marketing budget to bring in a lot of customers. Seriously, how do we think that that situation’s going to pan out? If you’re not doing any marketing, how are you going to get the people into the restaurant? And I know when you talk to people that they’re waiting for that something to happen, but it’s very hard to do marketing without any budget. One of my pet peeves is, you know, people who say, “We don’t have money for a website.” Or, they’ve got a website, you know, they’re using a Wax one or something and it’s clearly not working for them, it doesn’t send the right message, it’s not building their email database, it’s not attracting customers, you know. And I’ve seen some websites that actually do quite a good job of SEO but the design of it is so horrible and the pictures, the photos of the food and all of the kind of things that are meant to sell in the website are just so horrible. You just think, “Wow, that’s,” I reckon people are going to that website and then deciding that they’re not going to eat there. And these are the people, and then they’ve got, “Well, I don’t have any budget to make a change.” It’s like, okay, that’s not really good. They spent a lot of money on fit out and I’ve spoken about this before. Every now and then, and probably less than 10 percent, you see a place and you think, “Wow, these guys have spent a lot of money on fit out and it looks awesome. I want to come here because, you know, the fit out, the atmosphere, the ambiance, all of those sort of things are really, really exciting about this place.” But far too often you think, “Wow, these people have spent a lot of money. I’m not sure why. It doesn’t really work. I’m not going to come back because of the way that they’ve set the place up. I’m not really sure what it is that they’ve spent money on.” Now, because one of the things that you need to think about is a lot of the time you’re going to be, so you’ve just decided to spend $200,000 on fit out. You’re going to be competing with people who are spending zero on fit out, you know. They’ve got a warehouse which they’re opening up and they’re going with an open plan kitchen. And so, that $200,000 on fit out that they’re saving they’re going to spend an extra $50,000 on getting better gear for the kitchen. Or, they’re going to spend extra money on marketing and they’re going to make it one of those places that is really well marketed before they open. So, I want you to have a think about it. I haven’t really spoken to the guys who do fit out. I think, you know, a lot of the time they’re very good sales people and they like to create this idea that, you know, a fit out is a very expensive thing and it makes a really big difference. But when you talk to your customers, I think you need to think about how much fit out is actually going to help in bringing in new customers. And how much it is just literally lining the pockets of the guys who do the fit out and not actually making a big difference. Something really important to think about, because you want to, you’re going to spend money prior to opening on marketing. You’re also going to be spending a lot of money after opening. You know, your biggest marketing spend is probably going to be in the first six months of the restaurant opening. You’re going to be ironing out a lot of problems, you’re going to be going through a lot of things, you’re going to be trying to build up a loyal clientele. Because you got to remember, you don’t have any regular customers on day one. So, there’s nothing that you can build off to start getting all of those customers in. You need to market, you need to prime the pump and get people into the habit of thinking about, “Yeah, I could go into that restaurant. That’s the place that’s got the really good,” whatever it is that makes people come in. So, you’re going to be spending a lot of money on marketing after you open, so you need to think that you’ve got that money squirreled away. Because far too many times, and I have seen restaurants that are fantastic close because they couldn’t survive the first 180 days of the restaurant being open. There just weren’t enough people coming in. Every indication was that they were going to be successful. They were getting quite a strong following on a Friday and Saturday night. It was dead during the week. Building up for breakfast time, everything was going well. They just ran out of cash and they didn’t have any money to be able to try and bring extra people in. Your USP, your unique selling proposition, you need to have been thinking about that. What is it that’s going to make you unique? And I know, I talk to, it’s always a difficult conversation to have with restaurant owners, because I always like to say, “What is it that makes your restaurant unique?” And far too many times I hear, “You know, we make great Indian food.” Well, literally there’s thousands and thousands of Indian restaurants, and they all say the exact same thing. They also, “You know, our food is amazing. It’s really authentic Indian food.” Now, even if it is really authentic Indian food, that is a very difficult thing to market because people are doing exactly the same way. You need to be thinking about your really clear points of differentiation. And you need to be doing it with a clinical eye. If that’s what you want to run with, go and eat your competitors and then go and eat in your restaurant, and find out if it really is different. Now, the restaurants not going to be open, so get your chef to cook something. Or, if it’s you, cook something up. Is it really better? And if it is, why is it? You need to be able to clearly articulate that. And when people come into your restaurant, they want to go, “Wow, yeah. No, this is the best Vindaloo I’ve had.” One of the things that I think’s a huge opportunity in our area is to make, you know, a lot of people who say it’s authentic and I go, “Wow, can you make me a really, really hot Vindaloo,” and they say, “Yeah, sure.” And I say, “No, seriously, really hot. Like, Indian hot. Like, if I can’t eat it, I would be happy if it’s that hot.” And no one ever can. I like really hot food, I don’t have a huge tolerance for it, but that’s one thing that people could say, you know, “It’s authentic, you know. Super, super, super hot. Warning: don’t order this unless you want something super-hot.” Something that makes people go, “You know what, this is like the kind of food that I would get in India.” I’ve never been to India but, you know, a lot of people say that the food there is a lot hotter and for Western markets it does get, you know, the temperature does get lowered quite a bit so it’s not as hot for people to, you know, the chilli temperature, it’s not as hot. What is it that you’re going to do to that makes it unique? You have to come up with something. So, now, hiring. You want to start thinking about your strategy with hiring. And I know what you’re thinking, “Hang on a sec, isn’t this the 90-day marketing plan?” It is. Hiring the staff, you are hiring the staff who are going to provide the experience to your customers. So, make no mistake, if you don’t get this right then you’re going to be in a whole world of hurt. Your restaurant, is it casual? Are we looking for a friendly conversation with the person who brings us our coffee, brings us our whatever it is? Is it formal? Are we looking for attention to detail? Each table is laid out exactly the same and it’s very formal and respectful? In the kitchen, you know, you want to be getting people who can work and work hard in a high-pressure environment. So, one thing that I always like to do, hire slowly and fire quickly. And the good thing about pre-planning this is that if you hire your people early enough, when you’re doing your trial runs of getting the kitchen ready you may realize that these people aren’t going to work out and get rid of them. It’s better to fire someone before they actually get tested in battle with real customers, than, you know, two or three weeks in. Because it’s a lot easier to hire prior to opening. You don’t want to be thinking, you don’t want to go a week in and go, “You know what, this person’s, two of these people aren’t going to work out. I’ve got to get rid of them, now I’ve got to hire again.” Go, you know, try and work out who’s going to be your A team well and truly before you get to opening day, because that’s going to save you a lot of headaches afterwards. And just as a quick thing, what’s your procedure for hiring? Have you got it written down? And I think it’s really important to write your procedure down, you should write your procedures down for everything. And, of course, this isn’t in your marketing plan, but it should be in your business plan. Start building your policies and procedures book. And one thing I’m really passionate about in our businesses is that let’s have a policy, right? “In five minutes write down what it is that we do to do this.” And it will be awful. But the next time we go through that procedure and it doesn’t work, we can add something to it, and we can add something and we can add something and over a period, when we do something 20 times, if everyone reviews that procedure after 20 times it’s going to be really powerful. It’s going to be really strong. So, that’s one thing that you need to be thinking about, as well. What’s your procedure for hiring people? What are your procedures across the board: purchasing, preparation. You know, now’s the time to start taking the pictures of the dishes and getting the menu cards write so that everything’s right for the people when you hire more kitchen staff. Now, we’ll talk quickly about the website. And I know that a lot of the time restaurant owners will say, “You know, I’ll get the website done three or four months after we start.” Well, no. The time to start getting your website done is, it should go live 90 days before you open the doors. And there’s a couple of reasons for that. First off, there’s a lot of scams on the internet. So, one of the things that Google doesn’t like is it doesn’t like a new website. How does Google know that this is a real business? It doesn’t. So, there’s a whole set of processes and it does not refer traffic to websites that are very new. So, you want to give Google 90 days to see the website, to do things like register your Google My Business postcard. So, you’ll tell them what the address is, Google will put that on Google Maps. That’s an important thing to get done. But it also means that you have to send, they’ll send you a postcard to the physical address. Google goes, “Wow, this is a real physical address, we can send mail there. It’s probably a real business.” That makes a big difference in your Google rankings. And we see this happen all the time, particularly with customers who come to us. I say, “You don’t have a Google Places Account. You’re not actually a verified business.” It’s like, that would probably be the first thing we need to do. So, that’s, you want to start 90 days out. Start telling that story. Your USP will sell itself to your target market. So, you want to have your USP in there. You want to have contact details. You want to let people know that you’re hiring, or what it is that you’re looking for. You want to start positioning people with the kind of food that you’re going to do. So, later on we’re going to talk about the menu. As you start doing your trial preparation, you know, and start going through the menu, start taking photos. “Hey, we’re thinking about putting one of these on the menu. We’re thinking about putting one of those.” You know, as you start to firm it up start putting that on the website. One of the things that you want to be thinking about with your website is it needs to be editable by you, so that as things change you can make the changes yourself. And far too many restaurant owners struggle, and my pet hate is when, you know they’ll put a PDF in there and their web developer will do it and then they have to go back to their web developer to get a new PDF uploaded of, say, the menu. And PDFs are bad because, you know, on a mobile phone a lot of people can’t actually find where the PDF has gone to, so they can’t actually see what’s on the menu which means that they’re not going to come and see you. But they have to pay their web developer to make those changes. And I’ve spoken to people, it’s like, “Wow, the prices are really cheap here.” It’s like, “It’s just such a pain to put our prices up.” It’s like, are you serious? If you’re cooking really good food and you’re really busy, you should be thinking about putting your prices up because all of the money from that price increase flows all the way to the bottom line. That’s just pure profit. A five percent increase in prices across the board could be a 25 or 30 percent increase in profit. Now, would you like a 30 percent increase in profit? Maybe you would. That’s the kind of thing, you want that flexibility to be adjusting prices on the fly. So, you’ll need to register your domain name, you’ve got to get your domain name. And, a lot of the time, we’ve seen people who’ve come up with a domain name that’s not great because of the fact that, “We wanted this domain name but it had already been taken.” So, you need to be thinking about what domain name. And as soon as you decide on the name of the restaurant, you should be thinking about the domain name. I like boring domain names, which isn’t great from a marketing point of view, but from an SEO point of view it’s fantastic. One of our trial websites is narrewarrenindian.com.au. So, Narre Warren’s a suburb of Melbourne and Narre Warren Indian, so it’s a trial Indian restaurant. Now, we’ve been fairly explicit on that website to say, “This is not a real restaurant.” We still get, because we’ve gone through our normal restaurant marketing process with that to test various bits and pieces, we get people ringing up and saying, “I’d like to make a booking.” It’s like, “Well, no. It’s not a real restaurant. It doesn’t actually exist.” But people are looking for Narre Warren Indian, and even though we’ve done everything, you know, we told Google it’s not a real restaurant, it still refers traffic to it because of the fact that that domain name is so strong. So, that’s something to think about. The other thing that, the other reason that you want to get your restaurant website up early is because you need to start thinking about getting links. So, you’re not going to be able to get links to the website if you don’t have a website. So, part of Google’s algorithm for working out who’s going to come first in a search result is how many people link to it. And it’s also, in the early days, is this a real business? If you got, you know, links from three or four reputable websites, websites that Google thinks does a really good job of being a legitimate lister of business, then you’re more likely to get traffic to the website early. So, local business chambers. Your suppliers, you know. Who are the people that you’re buying, particularly local suppliers, you know? “Find our product in this restaurant, this restaurant, this restaurant, boutique, wineries.” All of those kinds of people. 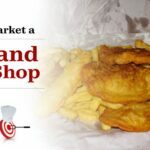 “Would you mind putting a link to our website on your website?” And a lot of the time they’ll do that, because it’s driving people who want to get their product, “Yes, I can go to this restaurant and get it.” The local business chamber, councils will often have a list of businesses. This is one of the things that you should do is, you know, go and talk to your local business chamber, your business networks and councils and see what services they’ve got to help you promote. You want to be doing this, you know, sort of 90 days out because, once again, once the restaurant opens then the demands on your time are going to increase massively. So, now’s the good time to be sitting down, have a friendly chat with the local council and say, “This is what we’re thinking of doing. This is what we’re hoping to achieve. How can we find some customers? You know, have you got a listing that we can have?” All of those sort of things make a really big difference. The other thing that you want to do is you can say, you know, “We’re going to be, opening will be in late August. Give us your email address,” and start thinking about what kind of opening night you’re going to have. Because if you’ve got that idea in mind, you can start getting people to, “Give you your email address and we’ll let you know when our opening night extravaganza’s going to happen.” That’s a great way of building a database. You might get 50, 100, 200, 250 email addresses of people who want to find out when you’re opening night’s going to be. Now, what’s opening night going to be like? Probably huge if your emailing out to 250 people. So, they’re the kind of things that you want to start thinking about with your website. Same same with the Facebook page. Now, the Facebook page doesn’t have to be as early. I think, you know, you can probably start doing this 60 to 30 days out. You don’t need to be anywhere near as aggressive with that, because Facebook will start, you know, you can run a Facebook ad from day one with no likes and Facebook will refer traffic to you without any problems. That’s fine, no problem there. So, website first, then Facebook. And the good thing about getting your website up first, it’s going to start getting you thinking about content, and when you start getting those images that’s what Facebook loves. So, you can start doing that. Same same with Instagram. Now, so we’re talking website, now we’re talking about the visuals for your restaurant. So, what we really want to be thinking about is your menu, okay? So, we’re talking about how you’re going to sell people to come into your restaurant. And you really need to be thinking about your menu. So, this is the time to do all of the menu engineering kind of things that you need to do before you start. Now, menu engineering, and I’m looking at creating a whole heap of content around menu engineering, but it takes a lot of time to put it all together because menu engineering it’s a, you know, there’s lots of things. There’s psychology, there’s economics, there’s marketing, there’s food science, you know, productivity issues in the kitchen. All kinds of exciting things to think about when you’re doing menu engineering. So, I will do a podcast, I actually think it might be a two- or three-parter, because menu engineering is such a big thing. But there’s a couple of things that you really want to start thinking about before you open. So, what’s going to be on the menu? What is it that you want the customers to buy? And how are you going to get them to buy it? So, you need to have some hero items on the menu. You need to have the things that are also going to get people in. The first thing that you want to do is to start costing out your menu items. Menu costing is a, it’s a very, very complicated process because you’ve got to think about things like wastage, the prep time that you’re spending, you know. Are you going to get salmon in whole, or are you going to get it pre-cut up into portions? How are you going to, what’s the trade-off between those? And what is the cost impact for that, and time? When you’re doing prep for the evening’s meal, you’ve only got a certain amount of time. Do you want to create something that’s super fancy? Do you want to do a lot of basic prep work? Or, do you want to get some portions in pre-made and then allow you to create something that looks a lot fancier and is going to look great on Instagram? Because this is something that you really want to be thinking about, what are the items that are going to look awesome on social media? Because you got to remember, social media is, it’s just word of mouth. There’s nothing fancy about it, but it’s just word of mouth on steroids. So, rather than 10 years ago saying, “I went to this dessert and it came out and it was on fire and there were flames going everywhere. And I tasted it and it was absolutely amazing, it was really good.” People are just going to take a photo of it and say, “This is an awesome dessert and they’re going to put it up and that goes out to all of their social network. What is the item on the menu that’s going to do that, and you should have at least one. You should try to have three or four. And it can go for anything, like all of the items on your menu start trying to think about the best ways that you can represent them. And so, we’ve talked about the Massaman Lamb Shank Curry that we had in a Thai restaurant in Sydney, and it came out with the roti in the shape of a tepee over the lamp shank. And when it came out, I was like, “Wow, what was it that I ordered again? Because I don’t like, have they brought the right meal to me?” And the people next to me were kind of like putting their phone over my meal to take a photo of it. Now, that’s a little bit rude taking a photo of someone else’s food, but I thought, “How awesome is that that this looks so visually appealing that someone wants to take a photo of it from someone else’s table, and it’s been brought to someone else.” I didn’t know these people from a bar of soap and they’re taking photos of my meal. Now, that is just a Massaman Lamb Shank Curry. It was an awesome lamb shank curry, as well. But the presentation was just amazing and that must get all sorts of social media and driving people in there. Because wow, that looks really cool, that’s a conversation starter, they’re the kind of things that fill restaurants. Now, if you can do it with a lamb shank curry, you should be able to do with anything. How are you going to serve it differently, you know? What sort of plates are you going to use? At Alinea they bring out a, one of the meals comes on a piece of concrete. There’s also, they bring stuff out that’s got pieces of tree bark and then they put some glass over the top of it. Now, obviously that’s a, there’s a huge amount of expense in doing that. But there’s lots of other, what is it that you can do in your restaurant to make it different, you know? Could you get some custom-made plates done with a picture on them or something, there’s 101 things that you can do. Start thinking about those 101 things because, once again, now’s the time to think about it. Now’s the time to come up with that time. Now’s the time that you can do those sorts of things. Once you’re up and running, you’re not going to have the time to be thinking about these sort of things. You’ll have all of the operational pressures and problems occupying your time, and you’re going to have to really fight really hard to try and get some time to work on the business not in the business. So, this is the kind of thing that you want to be thinking about it. So, cost your menu out. A really big thing. And we’ve talked about this in the past, you don’t want to be the restaurant that realizes six months down the track that your pricing’s out by 30 percent and that you need to put prices up and that you’ve run out of cash. Because that kills restaurants quicker than anything. Make sure it’s costed out and then start driving people, you know, when you get your menu’s printed start, you know, have something, you know, “Our most popular dish,” have it in bold. Have it as a stand out on the menu. Now, one piece of advice that I would give you about the menu, and I see a lot of people, you know, you go in there two weeks before they open and they say, “This is what the menu looks like.” And you can see a lot of money’s gone into getting a very, very fancy printed menu. And I just think, “Wow, that could be really costly.” Because they’re not going to reprint that menu. Now, after a week, what happens if you’ve got an entrée that not one person has ordered? What if you’d been really busy and there was an entrée there that not one person has ordered? It’s just taken up space in the menu, it’s costing you. Now, you need to get rid of that. Now, that’s one week after you’ve opened. You don’t want to be, and it might be too years before you get that menu reprinted which means that it’s going to continually be there. So, next thing you want to start thinking about is referral partners, and by that what are the businesses that are around in the area who have people that would want to eat in your restaurant? So, the obvious one is the local cinema. What clubs are there, so local cinema on a, what sort of deal is it, you know, “Bring your movie tickets in and get one of these.” Or, “Buy a meal here and spend over blah per person and get a discounted movie ticket.” What is there, you know, can you get some movie tickets that you can sell to your customers at a discounted price? Can they sell some meals to their customers at a discounted price so that you can drive traffic both ways? Have a talk to them, see what they’re interested in doing? What clubs are there in the local area? Particularly, and this is one of my favourites, if you have a Chinese restaurant and you employ mainly people who speak Mandarin then why don’t you run a, you know, offer to run a monthly get together of a local Chinese language school, have them all come in and all you have to do is tell your staff not to speak in English. So, they’ll speak in Mandarin, that, now, that’s really exciting and I love these because, once again, we’re moving beyond food and selling and experience. So, they’ll go to your restaurant and they’re going to order off the menu, but they’re going to do it in Mandarin. You know, structuring your menu through the day, do you want to, and it was actually it was really interesting because it was a fish and chip shop in England that’s actually started doing this. So, they listen to the podcast and they’ve come up with some afternoon specials, because who is that’s going to be walking past your place? Now, you don’t have to wait until Opening day to do that market research. You could just stand out the front of your restaurant and look at the people and look at the demographics through the day as they change. So, during the day you might have a lot of business people, a lot of tradies going up and down. Then after school finished, you’ve got all of the school students coming up and down. What’s your offer to school student? What is it that you’re thinking? Can you go and approach the local schools and say, “You know, this is an offer to all of your kids. We would like to, you know, provide an offer to all of the students here.” Same at a uni, you know, how can you push out an offer to uni students? These are the kind of things that are going to give you a really good chance from opening night onwards. Happy hour, what’s your happy hour strategy? Doesn’t have to be expensive, doesn’t have to be brand alcohol, but something to try and get people in at the start of a night so the place looks full. Now, so we’re nearly getting to the end. Opening night. Let’s have a think about opening night. You only get one chance to have your first night. So, how are you going to handle that? Now, one thing that a lot of restaurant owners do, which I am not a fan of, is they have soft openings. So, they’ll open, they’re open this week and they just opened the door. And they’re just going to let walk ins come in. And I completely understand why people do this because you’ve got a kitchen that you’ve never used before, you’ve got kitchen staff that have never worked in the kitchen before, and you’ve got a front of house team that’s never worked together before. And front of house and back of house have never worked together. And your procedures are probably pretty loose. And you don’t want to have 100 people come in, on opening night, because any issue that you’ve got, any issue whatsoever is going to be magnified 100 times. If it’s going to be a really busy night, you’re just going to upset a whole lot of people. The food’s going to be no good, service is going to be awful, they’re going to be waiting, you know, hours for their food. And you’re going to get so many people who are unhappy, it’s going to be a nightmare. So, I totally get that, you just want, you know, just a few people to come in. But can you have a pre-opening night? So, rather than your big grand opening which you’re going to advertise far and wide to all and sundry, in your target market not to everyone but in your target market, can you have a pre-opening night? Get all of your family and friends to come in, which is, you know, what a lot of people do anyway. “We’re opening up a restaurant, we’d like you to come in, we’re going to trial some things out.” So, that way, if it goes pear shaped people aren’t going to be too upset. But and the other thing is, here’s the other thought. Could you use Facebook? And I’m thinking of a post like this, “Our grand opening is on the 30th of June, but we’re still testing our menu, we’re still trying to work out what’s going to work for us. So, we’ve got three, we’re going to be open for three nights before then where we’re going to test our menu.” And so, you might just have like a tastings menu or you might do a full service to try and get things out. So, “It’s going to be 50 percent off,” or you may or may not do an offer. “We’re going to be trialing different things, we haven’t worked out what’s going to be on the menu yet. And what we’d really love is if you come in, here’s the pricing,” or, you know discount pricing because this isn’t about revenue. This is about getting it right and getting your procedures right. So, you’ll pay good money to get that right so that you can have a smashingly good opening night and get people to come along. Maybe give them an offer when they, once you actually opened. So, it gives you the opportunity, and, you know, same with front of house. “How did you find the service? Was the wait too long for the food, blah blah blah blah? What do you think of the ambiance? What do you think of our fit out?” All of those sort of things can go really well, you know. So, whether you’re doing just Facebook to get feedback on the menu or actually using Facebook to build people, Facebook and Instagram sorry, I keep forgetting Instagram. Don’t forget Instagram, you know, put two pictures up. “This is one of our contenders for the one burger we’re going to put on the menu. What do you think about it?” You’re building a community. People are you giving you say, much more likely to come in. And I thin that that’s really exciting, which means that you can then be good to go, relatively good to go, relatively confident that everything’s going to be alright on the night when you have your grand opening. And so, there’s the big opportunity. Now, you can get the press, you know, the local newspapers. Maybe, you know, the national newspapers. Food reviewers, bloggers, you know. Reach out to bloggers get them to come along. Local business owners. And you may have an offer, you may not. If you can do a good enough job of building a viral community, particularly through Instagram, Instagram’s really good at this, then you may not even need to offer a discount. And the place will be full. And the one thing that you want from your grand opening night is the picture of the queue out the door, because, “Oh my God, the new hot place.” “Yeah, it’s that restaurant that just opened. It was like, there was an hour wait to get in there. There was people everywhere it was huge.” Now, that has, so that is the best possible start that you can get. It all comes down then to the three Gs: great food, great value, great experience. If you’re not providing those, people will say, “You know what, it was an hour wait to get a meal that was awful and I won’t be going back there.” So, you’ve got to be able to deliver and this is the thing, this is why you have those pre-trial openings so that you can bring you’re A game on opening day. But lots of opportunities there, you know. Inviting your suppliers, you know. Whether it’s, you know eggs from the local, yeah, so whether it’s eggs from the local egg farm, your chicken supplier, wineries. All of those sort of people, the people who, linen, anyone. Anyone who’s actually selling things to you, “I would like to invite you.” Now, they are looking at you as a customer, so they’re much more likely to come. You could fill a room probably with suppliers. So, you set the day up, you get the room full, everyone goes away happy. That’s the perfect launch for your business, and that’s what you really want to be thinking and planning towards. Because I think that it’s very hard these days to open a restaurant. Far too many people don’t get it right. The budgeting’s not right, the marketing plan’s not right, the business plan’s not right. There’s fundamental, and often it’s all three. Often there’s a series of fundamental flaws, which means that all of that hard work, all of that effort that goes in is all going to be for naught. And, you know, I see it when you walk down a street you see, you know, ‘for lease’. You see that sign. And I always think it’s really quite sad, because 99 percent of people they go walking down the street and they go, “Yeah, that place is empty. Yeah, there have been a few restaurants in there.” But it’s so much more than that. It’s people who’ve lost their jobs, it’s a restaurant owner who may now be $200,000 in debt for a business that they set up that no longer is running. So, they’re going to be paying that off for the next 5 or 10 years, and I hear that story far too often and I think it’s one of the saddest things about the restaurant industry is that when it goes pear shaped these people are left with horrendous debts. But the thing that’s even worse than that though is that it’s someone’s dream that died. Someone who really just wanted to run a restaurant, that was their dream. They were going to provide hospitality to all of their friends and all of the people in the local neighbourhood. That was what they wanted to do for however long they’ve had that dream for, and it’s died. And too often it comes back to not planning things like their marking, their business plan, their budget, all of those sort of things. So, hopefully if you’ve already started, there’s a few marketing ideas in there that you can get. If you’re thinking about it, and I’ve done this because I know a lot of people use our tools, a lot of people sign up for the 5-minute-a day restaurant marketing MBA and there’s a lot of people who listen to Secret Sauce who are in the planning stage. And that’s the time to be thinking about it. That’s perfect. So, hopefully there’ll be a lot of things in there so that when you start, you will have a good marketing plan, you will be able to hit the ground running and you’ll have a much, much, much better chance of success in your restaurant. So, there you go. If you do have a restaurant, I hope you have a busy night. Otherwise, if you’re planning on opening a restaurant, I hope you have a really busy opening. Okay, bye.